We're switching between Turkish TV channels. It's Monday evening, October 12, and in Turkey they're burying the victims from the country's worst terrorist attack in modern times. Newsanchors have tears in their eyes. 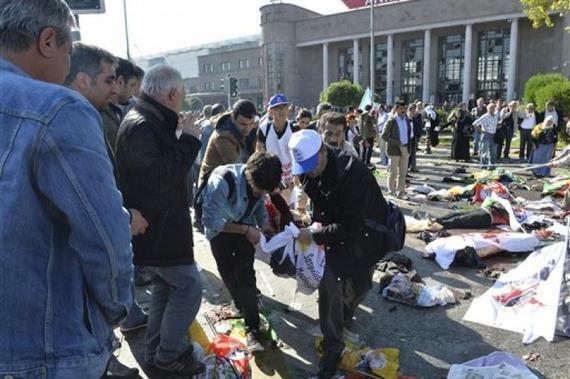 Pictures from funerals in several Turkish cities are shown. The bodies have been sent to their home towns. In Ankara and Diyarbakir, I see my friend MP Erol Dora amongst others, leading the peace demonstrations. The day before the funerals I held a lecture in Germany about radical Islam and what it means for non-muslims, like Christian Assyrians/Syrians but also for moderate Muslims in the Middle East. I had lunch in Wiesbaden, in the part of town that is commonly known as Little Istanbul. The waitor accused the Turkish President for the terror attack, he said that the President , who "himself is an Islamist", has provoced hatred towards all who choose not to live accordingly to radical Islamists beliefs. Later in the afternoon, during my lecture, I showed a video of three Assyrians who ten days ago were murdered in front of an ISIS-camera in Syria. The terrorists forced three other kidnapped persons to stand behind the dead victims and (in the same film) say that they also will be killed if a ransom isn't payed to save their lives. After the lecture I visited the brother of one of the victims killed in front of the ISIS-camera. The brother and his family have fled to Germany. The atmosphere was heavy, there was ten of us in a small two room apartment, but it wasn't the small room which made it hard to breathe. It was the sadness and the horror in the eyes of the black clad people. A strong, bitter, black coffee was served in small cups to remind us of the grief, and later tea to wash it down. They talked about the kidnapped, those killed and those ISIS are threatening to kill. They know most of the 200 people from the Khabour area in Syria, who are still in ISIS hands. They're their friends and relatives. They are doctors, teachers, journalists, artists, farmers, hairdressers, they are people born into another religion than the one allowed by the Islamists. We also talked about the persecution of the Christian refugees in the German refugee camps. In the car on the way back to the hotel, a friend called and reminded me of an article I wrote two years ago, published here in Dagen, about Turkey's support of the terrorists in Syria. A terrorist leader had been arrested in Turkey, surprised my friend wondered if the policemen had gone mad. They couldn't arrest the terrorist since he received help from the Turkish intelligence to overthrow Bashar. Teachers, lawyers and other activists were killed in Ankara. Maybe it wasn't Erdogan who gave the orders but there is no doubt about that his use of fundamentalistic, rasist and religious rethoric have encouraged attacks against people who don't share his point of view. This is the same Erdogan who is compared WITH Christian Democrates in Sweden, by Swedish foreign correspondents. It's tim to clear the air, Erdogan you are to blame.